Times change, projects change. And this blog has been neglected ... and it's moving! More on that in a few. This past year has been a doozy. I'm honestly glad it's over, too much illness and shake ups (literally too with the Napa earthquake)! However, I've done a lot of great things over the past year, mostly a lot of thinking, pondering and exploring. And it's finally all come together this past January. I have several big projects going on at once right now, all excellent! 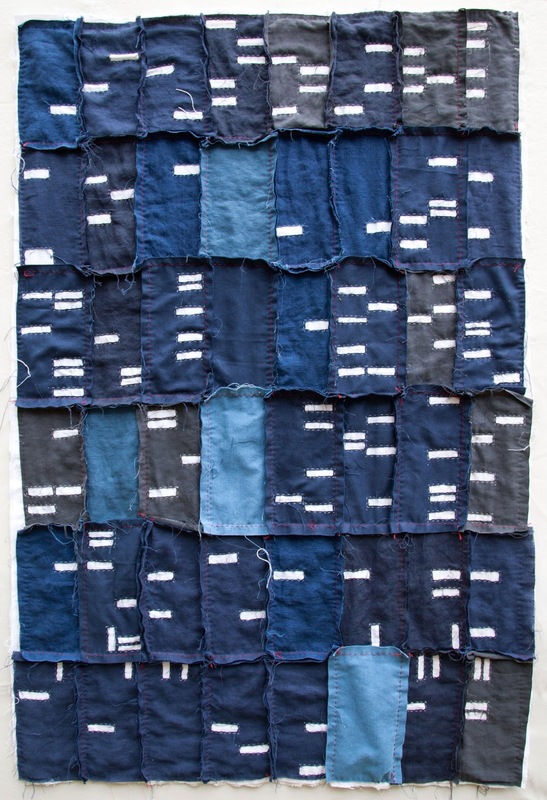 Washington DC Foreclosure Quilt top, 2015 by Kathryn Clark. My biggest piece is my latest foreclosure quilt of the Capitol Hill neighborhood in Washington DC. It's definitely been the most challenging research and piecing I've ever dealt with. As charming as Pierre L'Enfant's angled streets may be, translating a scaled road plan to pieced fabric has been a nightmare. Let's just say I have mastered measuring and assembling angled quilt pieces. Next up was a piece I completed in December for a show at Rare Device in San Francisco entitled Dead of Winter. It was curated by my friend Tiffanie Turner and included some great work including beautiful pieces by my friend Sonya Philip. The piece addresses the chemical transfiguration that occurs within a plant's cell structure. I plan to make more of these soft sculptures this year. It sort of keeps my toes dipped in the fine art world and I love the freedom the medium brings me. And finally, my biggest project has been the development of BlockLab Studio. I'm in the process of building a new website (and blog!) to house the whole idea. Head over to see what that's all about. 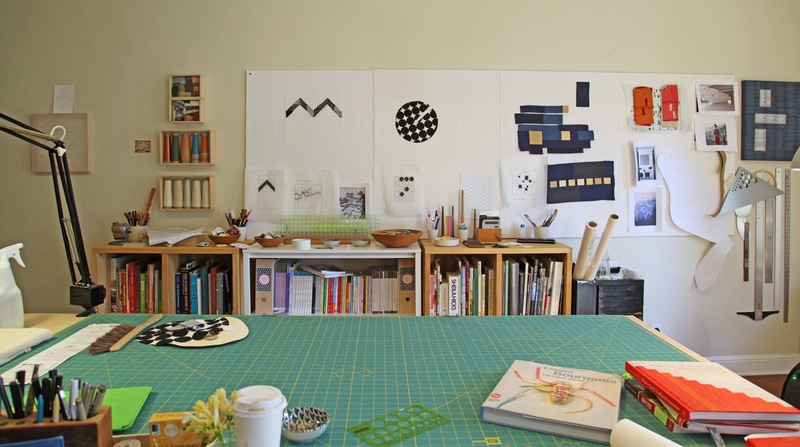 I'll also be teaching workshops in conjunction throughout this year, including a quilt block design class at Arrowmont school of arts & crafts in Tennessee. If you want to see what I'm up to these days, head over to my Instagram feed to see my process and check out my new blog for BlockLab Studio. My website is still going full swing with lots of updates on shows. And I'm still sending newsletters with the latest info. Email me at kathrynatkathrynclarkdotcom to be added to the newsletter list. It's been a long great ride on the blog and it's not over, it's just in a different place with a bit of a different direction! It's been much too long since I posted here! Who knows if anyone is still paying attention to this blog! I have lots of great news to share soon that is in the works, including a new website that will feature a line of quilt blocks I'm currently designing. 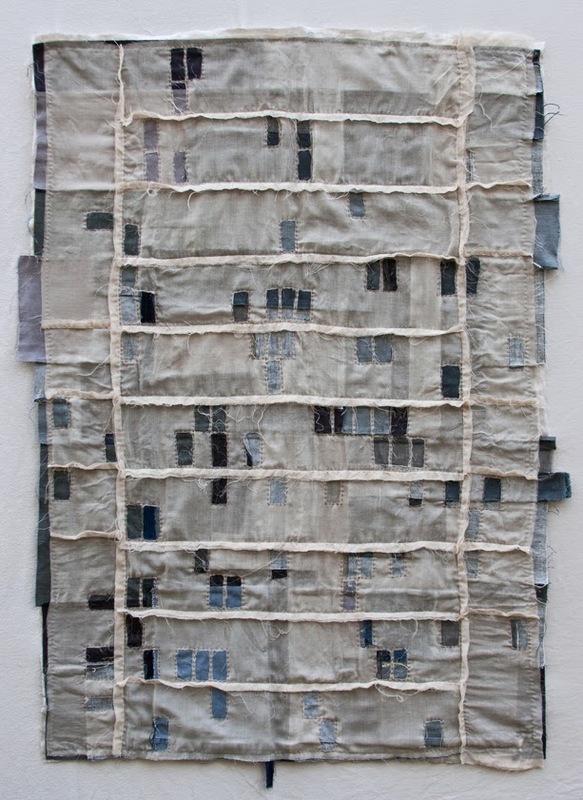 And I will have exciting news to share around January, HUGE awesome news about my Foreclosure Quilt series. 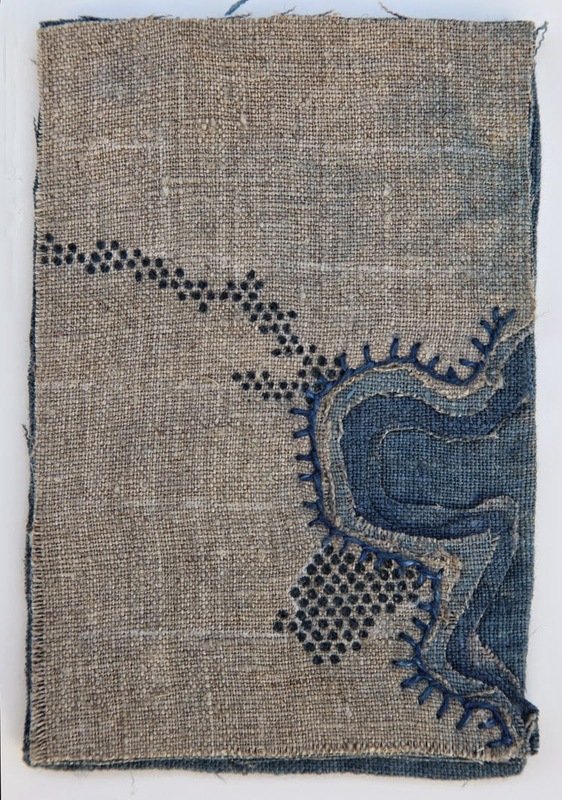 In the meantime, I will have four little postcard sized textiles on exhibit at Artstream Studios and Gallery in New Hampshire in a show called "Good Mail Day". 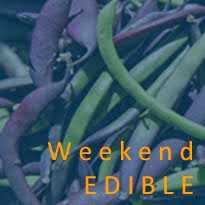 It's curated by my friend Lisa Solomon and Susan Schwake. It features 60 artists and the work will be available for purchase online here. 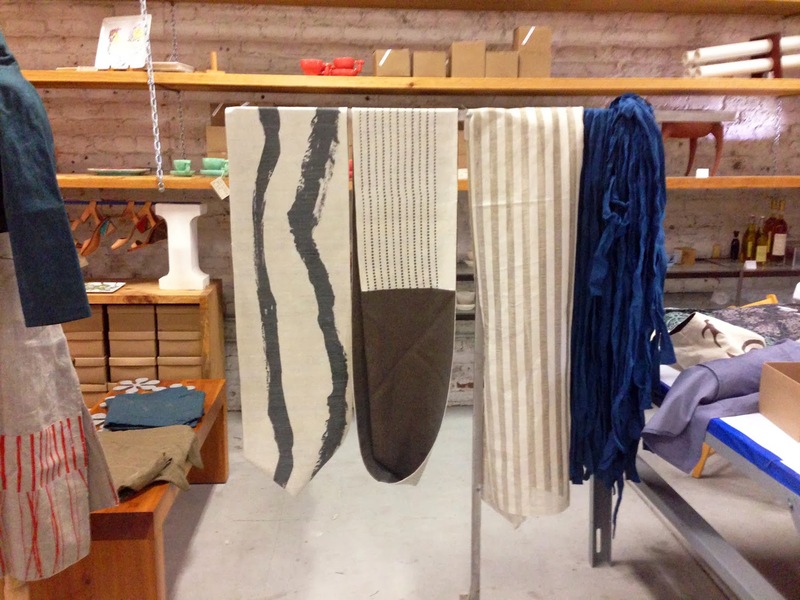 Here are some pictures of the pieces I made using linen that I indigo dyed over the summer. I designed a quilt block about water resources and this idea grew out of that design. The Ogallala Aquifer spanning eight mid-Western states is rapidly being depleted due to overuse of farming irrigation, specifically, the Center Pivot Irrigation system. This form of irrigation has become so efficient that farmers have really pushed the water use to the extreme. 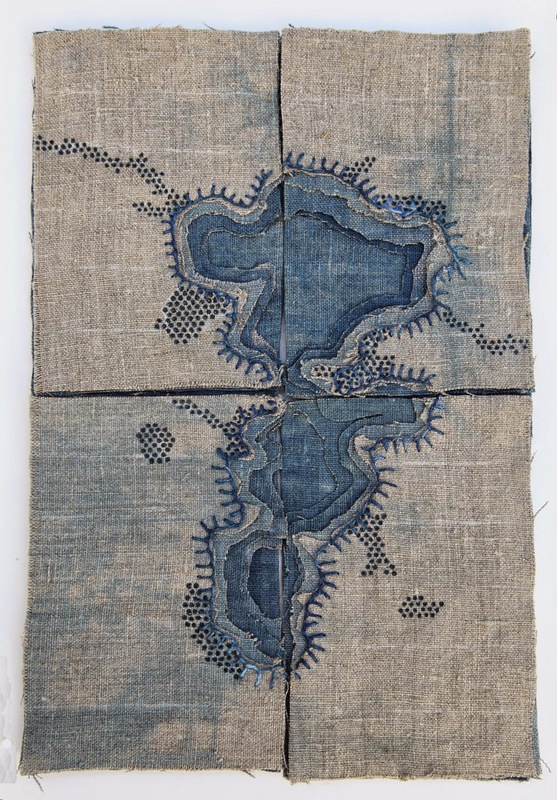 linen textiles with embroidery and ink. Upper left piece. And now scientists say there will be no more usable water in the aquifer by 2030. That's right, 2030! It's just around the corner! This is the major water source for a huge majority of our US crops. Be sure to check out all of the amazing work in the exhibition that starts November 7th and runs through December. See my four here. 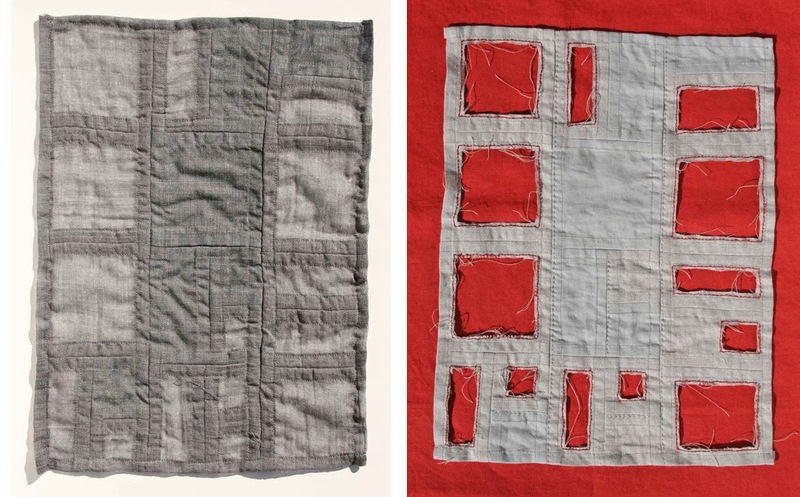 Two of my foreclosure quilts will be included in an upcoming exhibition at SMINK Fine Art in Dallas, Texas entitled City Grid/Urban Patterns. 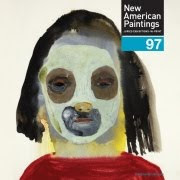 The exhibition opens Saturday, May 17th with a reception from 5-8 pm. The exhibit will run through August 2nd. Although I won't be at the opening, if you're near, I do hope you can stop by. My Albuquerque and Riverside Foreclosure Quilts have been framed for the exhibition and from what I've seen of the photos, the shadowboxes look amazing. Curated by Jennifer Smink, it will be quite a beautiful show, with work by Dennis Ekstedt, Timothy Hearsum, Diane McGregor and Thel. For more information, visit SMINK here. This year's Whitney Biennial has accurately reflected the rise of crafts in the art world. I thought it would be nice to sort through the 103 artists and feature the artists who use craft in their work. There is a lot of amazing art in the exhibition so be sure to check it all out in person or online. I just discovered the work of Lisa Anne Auerbach when I was listening to Andrea Zittel speak about her project High Desert Test Sites. Lisa lives in Los Angeles, where a lot of interesting cross boundary art is happening these days. 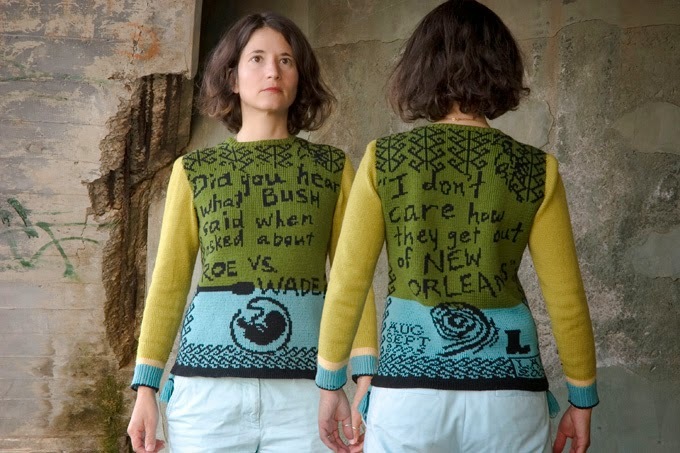 Her work in the Biennial include some examples of her knitted statement sweaters which she started making in 2004. This one I find particularly wonderful. You'll also find a large knitted tapestry that lists things psychics have said to her that could have been said to anyone. It goes with a megazine also on display. 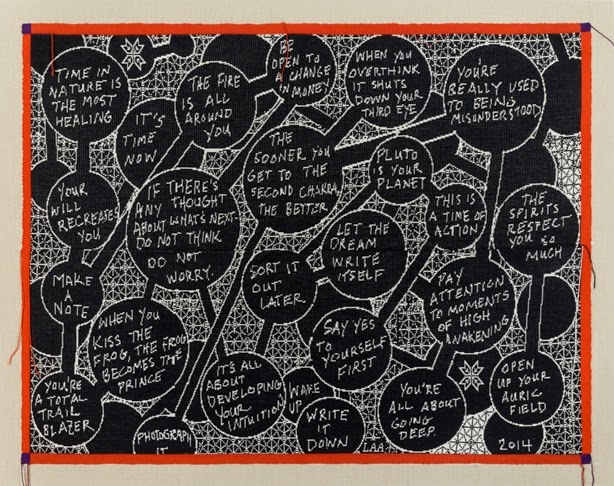 Lisa Anne Auerbach, Let the Dream Write Itself, 2014. 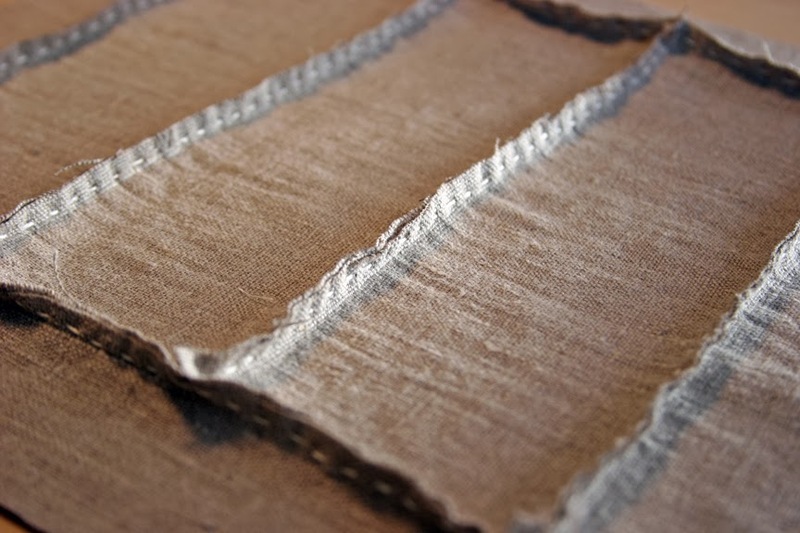 Wool, 63 × 80 in. (160 × 203.2 cm), Collection of the artist and Gavlak Gallery, Palm Beach. Copyright Lisa Anne Auerbach. Photograph by Lisa Anne Auerbach. 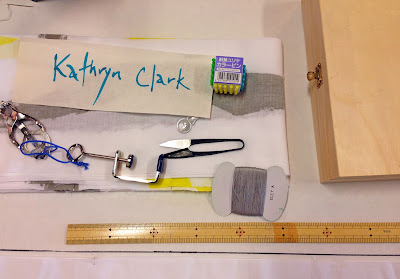 Check out more information about her work and watch a video tour through her studio over at the Whitney website artist info page here. Also, the New York Times did a studio visit here. 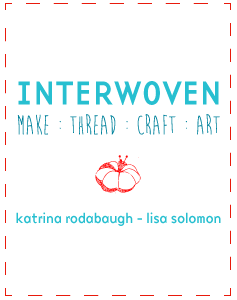 My friends Katrina Rodabough and Lisa Solomon will once again teach their online textile based class INTERWOVEN :: make:thread:craft:art. You get eight weeks of textile goodness featuring the how to's of crochet, soft sculpture, embroidery and quilting. The class includes step by step video tutorials, inspirational posts, artist interviews and suggestions for further exploration. If you've been wanting to learn some new techniques, this is a can't miss opportunity. The class runs from March 31st through May 23rd. What better way to spend your spring? Make some awesome art! Thanks to Lisa and Katrina (their smiling faces above), they're offering my blog readers a 10% off code SPECIALFRIENDS if you sign up! Read more about Interwoven and sign up here! What I plan to be doing for the next year. 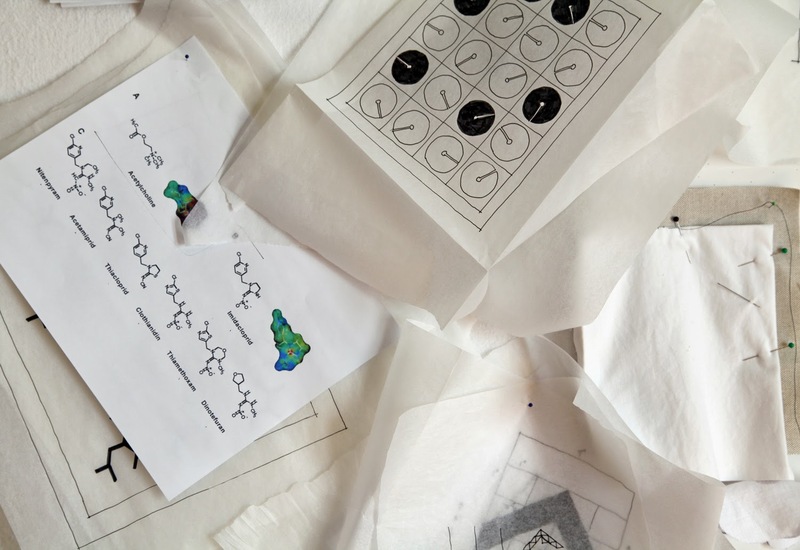 Lately my work studio has been filled with graphs, maps and molecular structures. Perhaps I'm crazy, but I think I've found a way to connect all of these seemingly disparate subjects into a new series. A work wall in March. 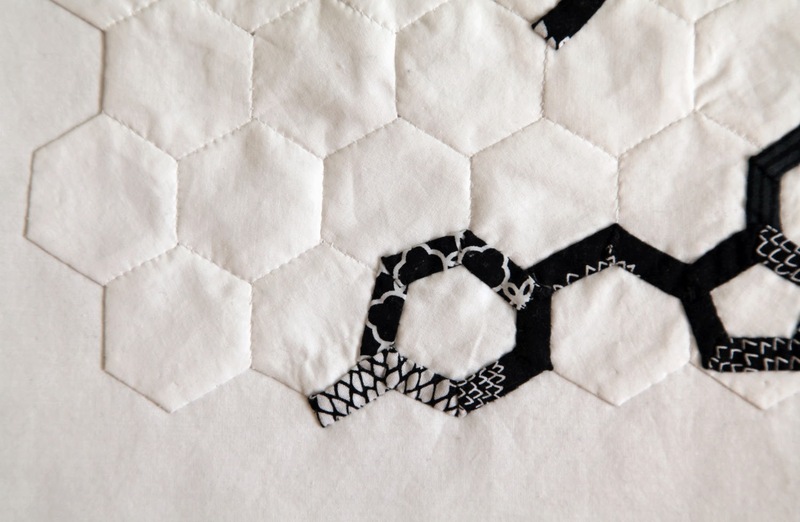 I'm in the process of creating a contemporary quilt pattern language. One that reflects our current society's issues. For years, we've replicated the 'wagon wheel' and 'jacob's ladder' patterns in more traditional quilts. And as I've learned from my past series, they can effectively used to record history and even offer new knowledge to viewers who were previously unaware. 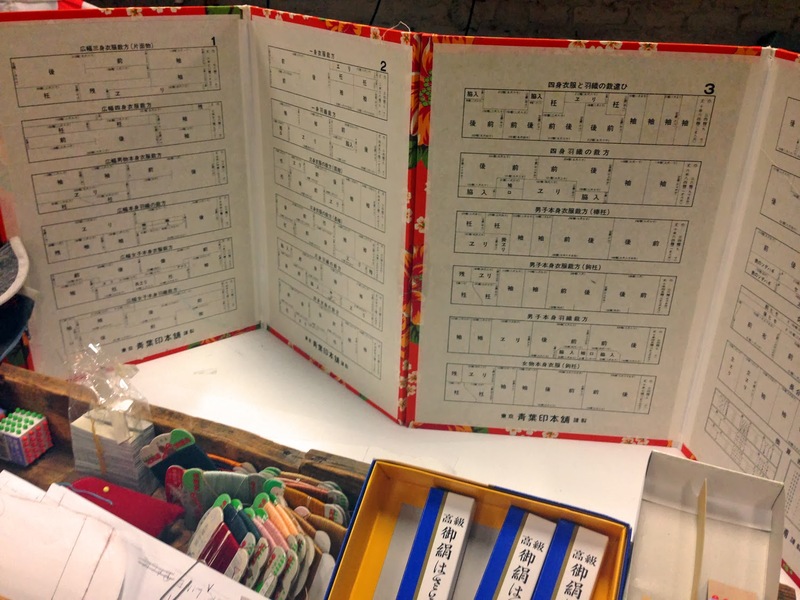 These traditional patterns are certainly beautiful but why not attempt a new pattern language for today? 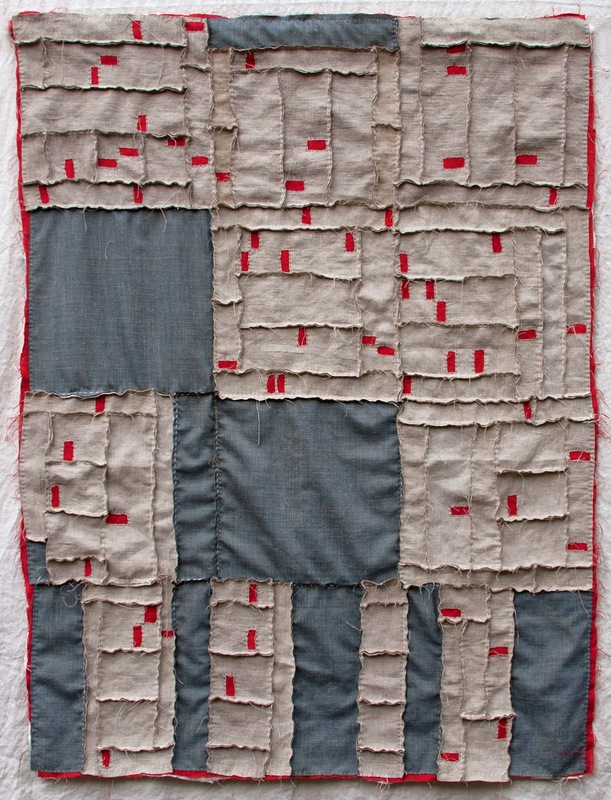 I was inspired when I read about the myth of the Underground Railroad quilts. If it were true, what a brilliant idea! So, why don't we utilize patterns to talk about what we're dealing with today? Issues like climate change, the digital era, migration, water and food security, etc. There are certainly plenty of artists addressing these issues but I haven't found anyone who has created something that could be used by others to generate new pieces and new ideas. So I'm setting out to create a body of work to start the conversation. 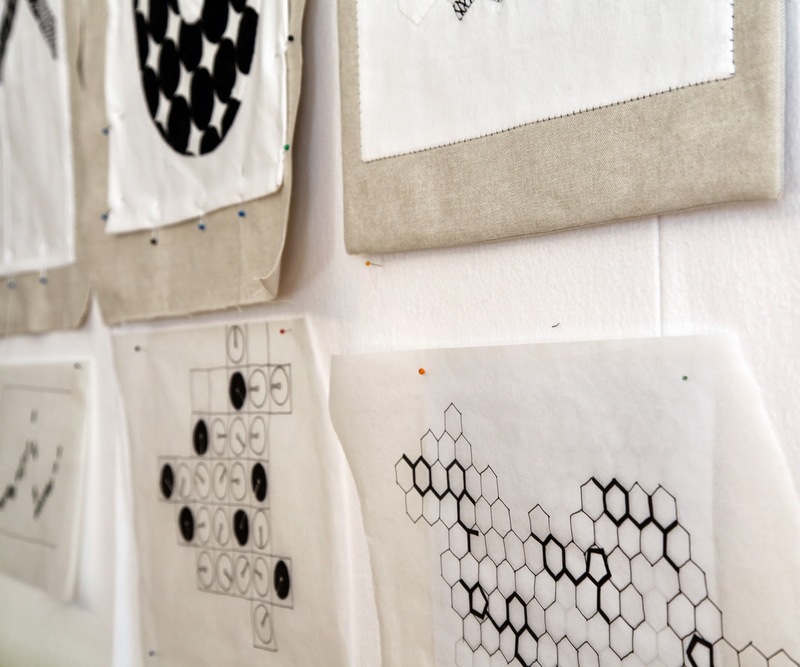 Pages from the fabric book with conceptual wall pieces sketched below. To kick off the series, I wanted to create some sort of book to reflect these new ideas. A lot of us know and love Louise Bourgeois' fabric books. What better way to pull of these ideas together into a cohesive form? 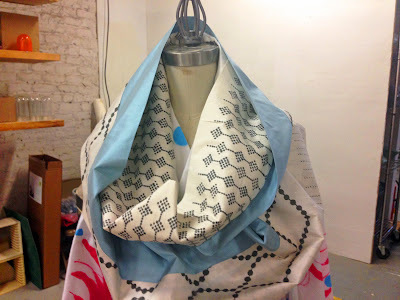 It allows me to work out the fabric construction while exhibiting the patterns. I'm only using black and white at this point to really focus on the graphic design of the pattern making. inpired by looking at my daughter's flip flops one day. 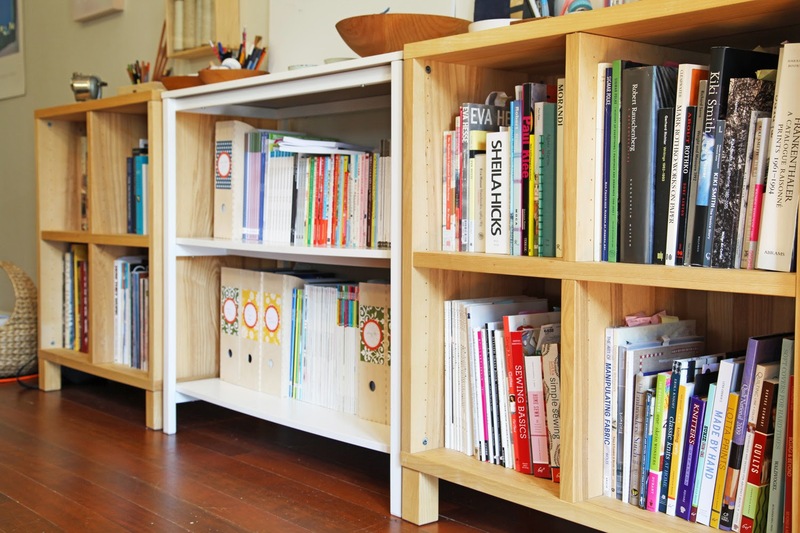 The patterns in the book act as a starting point to generate larger pieces. 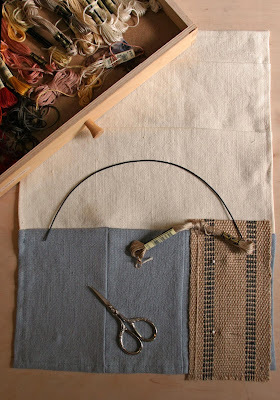 There are so many ways to use a pattern: altering scale, color and fabric. It's endless. Based on the patterns, I will create a series of large wall and floor pieces that are just one interpretation of the ideas. The stories about these patterns are still evolving and the wall pieces will reflect this. They will be presented using relevant visual mapping, statistical information and structuring, whatever the subject calls for. For example, below and above is a piece about Colony Collapse Disorder occuring in the bee population worldwide. If we don't resolve this problem soon, our bee population will dwindle to the point of not being able to pollinate our crops and hence, grow our food. 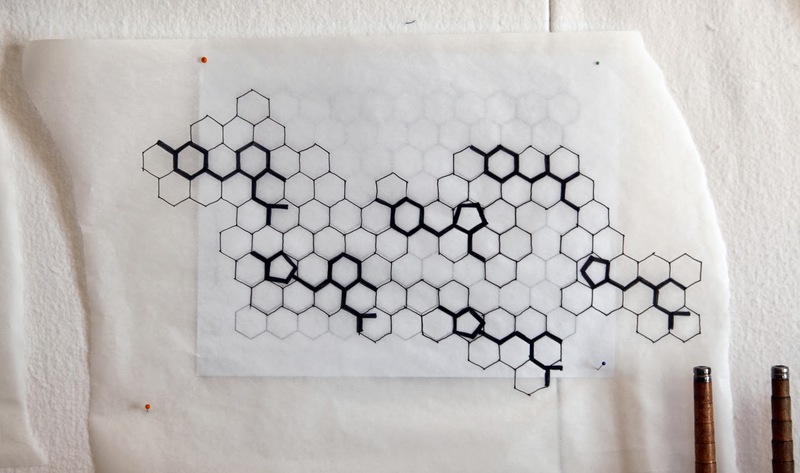 I'm simply laying out the molecular structure of the current causes of CCD, a series of pesticides called Neonicotinoids overlaid on top of the natural structure created by bees, the hexagon. Curious how visually related they are, isn't it? I suspect this project will keep me busy for at least a year. I'll delve into each of these patterns as I develop them. The possibilities are endless. work table : getting back into the routine ... finally! I've had such a blissful start to my week, back in the studio, back to my old routine which I missed SO much. A lot has happened since January 1st this year I can't say I'm shocked it's almost March already. A quick health update and a good one finally! After numerous biopsies and finally a surgery (really!) I learned I do not have stage IV cancer. Yes, that's what I had hanging over my head all of January. Amazingly, what looked pretty darn dire was not what it seemed. I'm still scratching my head over it all. I have something that just mimics all of that nasty stuff. And it's treatable, thankfully, by sometimes just doing nothing. Really! How's that for a wake up call?! So now back to our regularly scheduled program but with an added sense of appreciation to it all! But first, thanks to ALL of you wonderful friends out there who wished me well and sent good vibes my way. It all worked! seems to own Denyse Schmidt's Quilts book. Last week it seems a lot of artists were busy cleaning up their studios, myself included. I am in the process of a giant purge, clearing out the paints and old tools I haven't touched in five years. Letting go of the past is one thing I've really been itching to do over the past month. And now my studio is ready for some new work. And I'm making it, a lot, in fact. I will never tire of trace paper. I wish I had a larger dedicated drawing table. I'll only have some bits and bobs to show you for a few weeks until it comes more clearly into focus but it's moving forward in such a good way. I've never been happier and never been more pleased with how my work is going. I just wish I had more time to spend making it all. Patience is one thing that I've lost a bit of over the past month, understandably. But it's all so very, very good. The view from my sketch area of my smaller work wall. 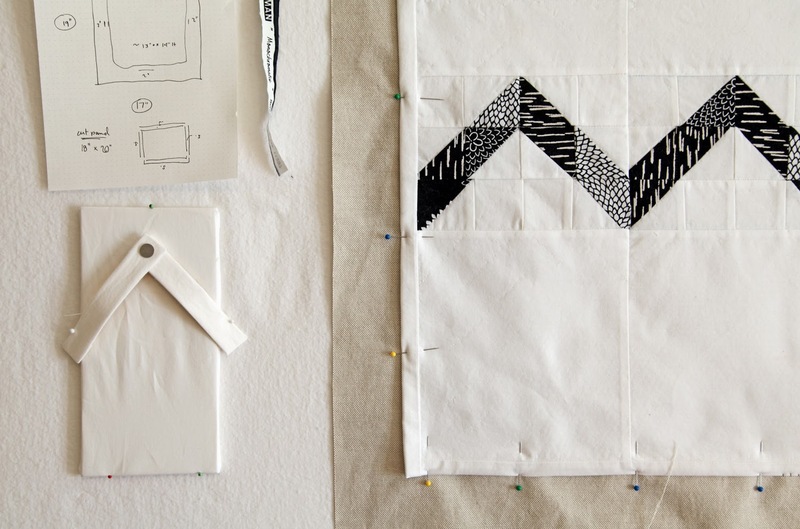 My new series initially involves creating a conceptual quilt pattern 'book' designed in black and white. Think Louise Bourgeois' Ode a L'oubli. 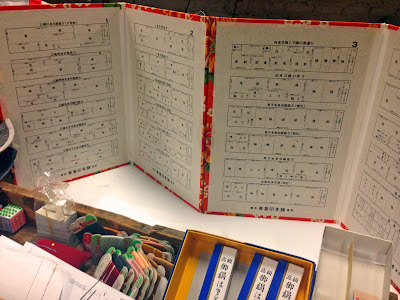 It's a way of investigating a much bigger idea that I have planned for this year. It really calls into practice all of those essential elements that I strive for in my work. All the while, I'm picking away at the studio clean up (see that pile on the floor on the bottom right below?). All outgoing! It's so wonderful to work in a clean studio for a change. replace this cheap one. Never buy Rowenta btw. They leak! I also have plans for a big website and blog overhaul in the coming months (that's a daunting task, isn't it!) so stay tuned. In the meantime, you can follow me on Instagram or Facebook. And check out what's inspiring me over on Pinterest. So much beauty over there! I hope everyone is busy making wonderful things and just being happy this year. We all deserve it, don't we? Send me some links to what you're working on in the comments below, I'd love to see some of it! January seems to be the time when most artists sit down to think about goals for the upcoming year. After a month of crazy health issues, which I might add I feel 100% fine during all of it, I've been thinking about the bigger life issues of really living the fullest life one can lead. I decided to really cut to the chase (which happens to be the title of my upcoming solo show at Stripe in Santa Cruz, CA) about what really makes me the happiest in my studio. If I'm going to spend the next few months not feeling great (and I'm still not sure about that yet since we don't know what I have), I at least want to make the most of my time when I'm making art. I always keep my eyes open to new ideas which involves a lot of research (yes, Pinterest counts as work!) and a lot of pondering and questioning. Over the past week, I've narrowed down the essentials of what I want from my art practice to six points. 1) I love sewing. When I'm not sewing, I wish I was sewing. Therefore, whatever I'm making in my art, it needs to involve sewing. 2) I love the process of making quilts. 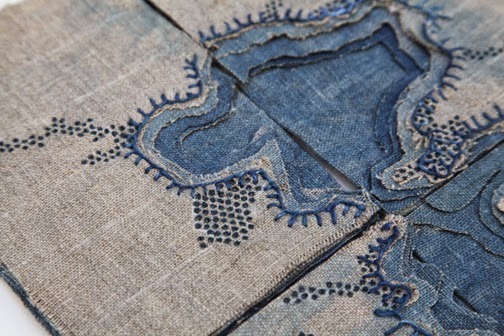 But they have to be quilts that are really art, first and foremost. The quilt is a medium for me, like paint or collage. 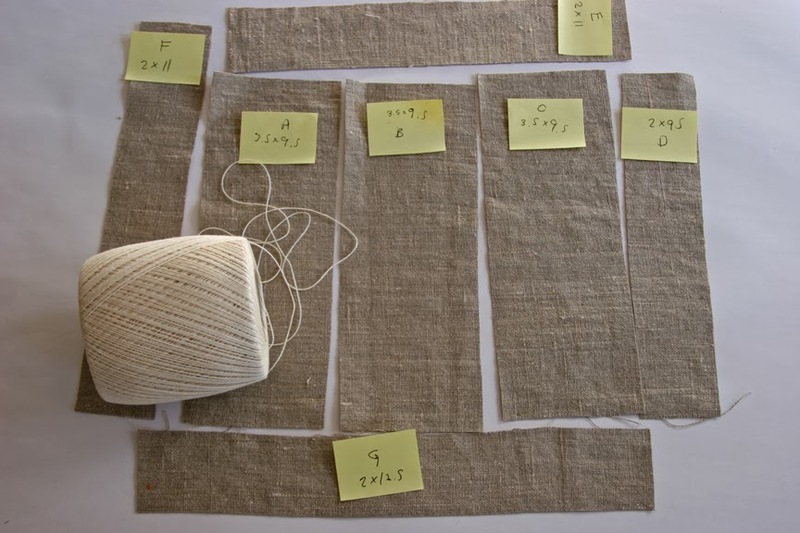 There's something about the measuring and cutting and organizing that I adore. Quilt blocks for Albuquerque Foreclosure Quilt before piecing. 3) I want to work on a larger scale. I keep coming back to certain works of art that spellbound me. They are all large. Really large. Mark Bradford, El Anatsui and Dorothy Caldwell all work on a larger scale. There were two things that happened last week that got me thinking about this more seriously. First, this review about my work in the Houston Sprawl exhibit. I loved this review. 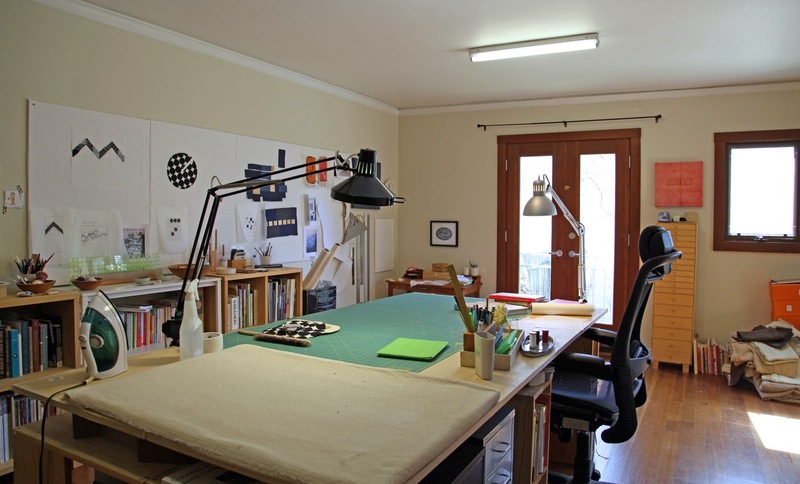 Then I came across the image below on Pinterest of Dorothy Caldwell's studio. Something about this image has stayed with me. 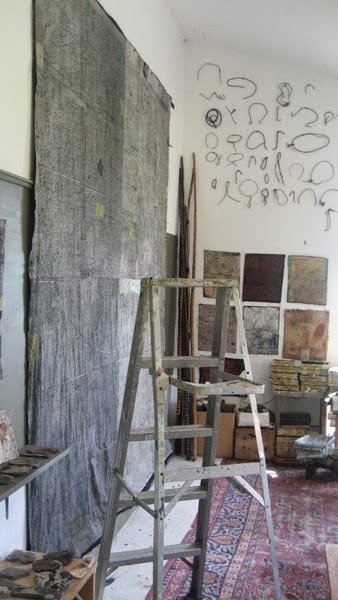 Dorothy Caldwell's studio. Image from Trout in Plaid. 4) My work must relay a message. I can not put pen to paper or needle to fabric without having some reason behind each stitch or line. And not just any message, I want to deal with the big issues, the powerful world altering issues that affect all of us globally. 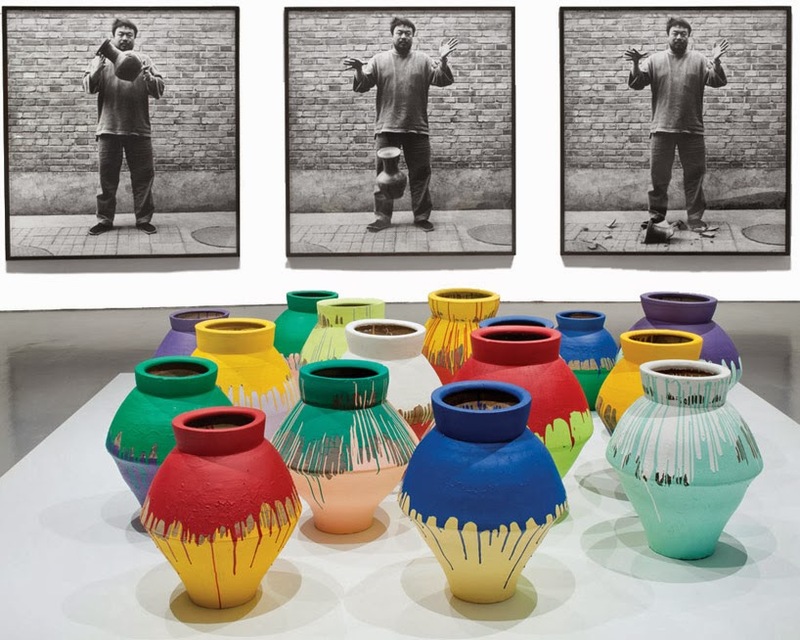 Ai Wei Wei has got that point down. 5) Research. If you know me by now, you know I'm always mentioning some statistic or pouring over some book that no one finds interesting but me. I love sifting through data to find a bigger message to summarize to people. on the Foreclosure Quilts. Eep! 6) Aesthetics are important to me. Always have been, always will. Aboubakar Fofana courtesy of Selvedge Dry Goods. 7) A little wit or deeper meaning needs to be in my work. I love the reaction people have when they suddenly 'get' the foreclosure quilts. I'd really like to work more with humor in my next body of work too. It's time for a little humor in my life! 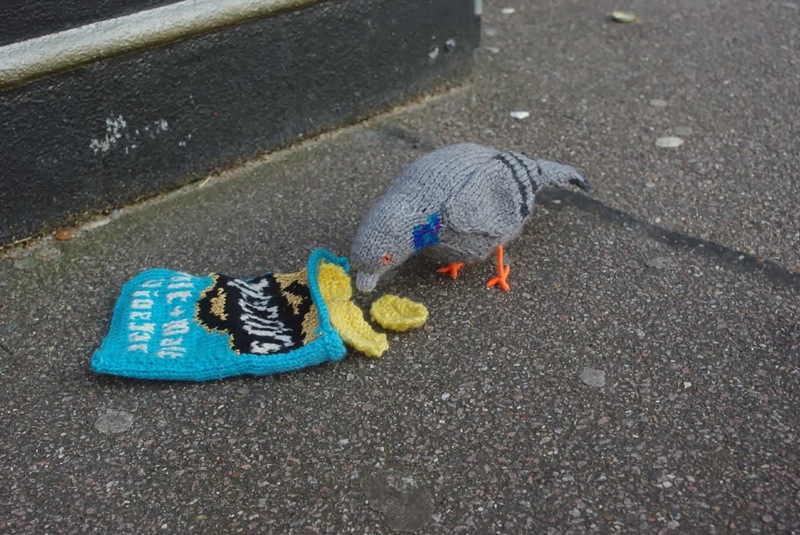 Feral Pidgeon Eating Crisps by Clare Sams. I love this! Now that I've really been able to hone down the essentials I've been trying to come up with some new ideas. I actually have a good one too! It's nice to have other things to think about than upcoming tests and doctor's visits. My next test is tomorrow and we will hopefully have some results by mid-next week. It's been over a month I've been living in limbo but thankfully, feeling perfectly healthy. And all the tests so far this year have been normal, which is great. So get creating! 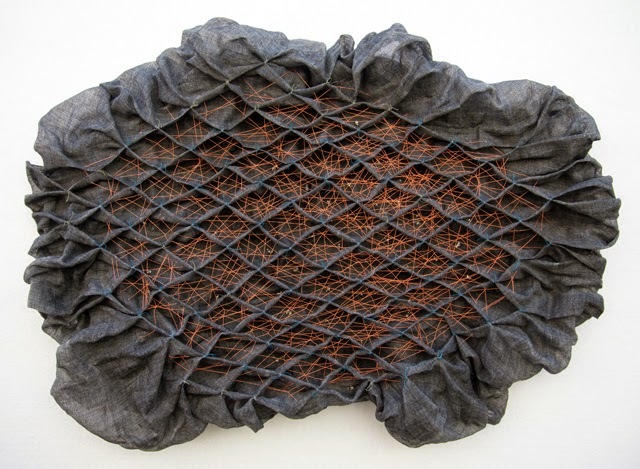 The wonderful exhibition, SPRAWL, at the Houston Center for Contemporary Craft is coming to a close on January 19th. 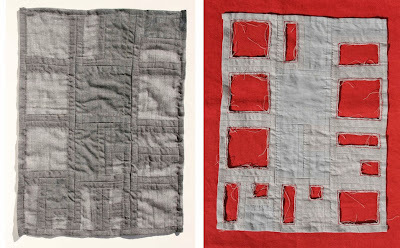 Three of my Foreclosure Quilts were included in the show. I really wish I could have seen the exhibit in person, it looked amazing from the photographs and has been incredibly well recieved in the press. 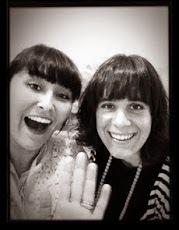 Hats off to Susie Silbert and Anna Walker for curating the show. I'll be sad to see it come down, actually. I heard from so many people who saw the show how much they loved it. I even made some great new connections through it. But, if you're like me and can't make it to the actual show, here are some articles about the exhibit. 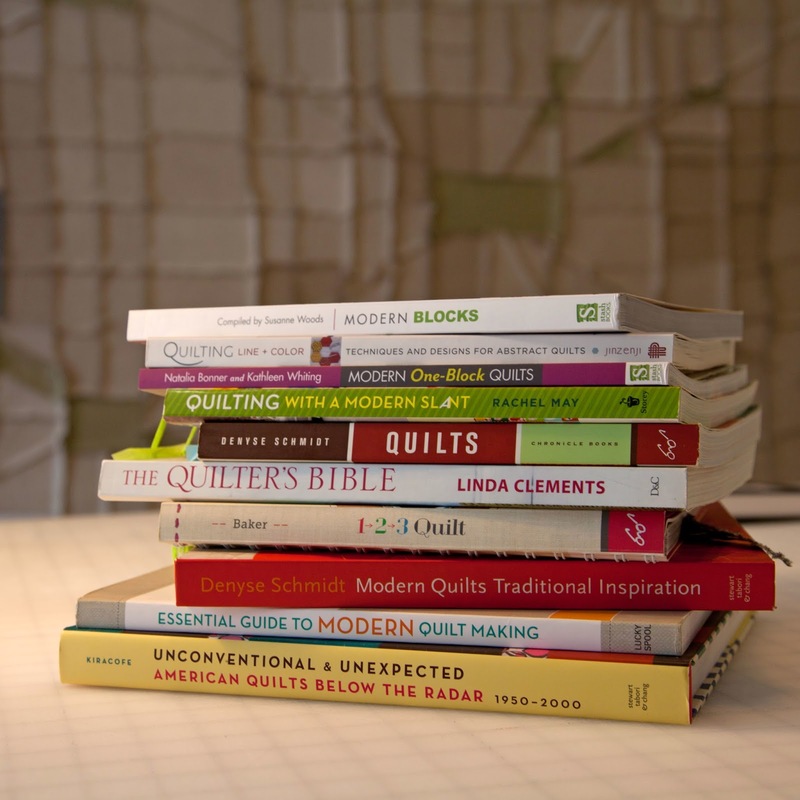 First in Houstonia Magazine, where I was interviewed for all of three minutes but somehow the author managed to write an amazing article that featured the quilts in the story "Sprawl is Beautiful". And a nice review of the show here as well. Next, you can peruse the show catalogue through ISSUU here. It's a fantastic catalog! Julia Gabriel's piece, below, is one of my favorites. 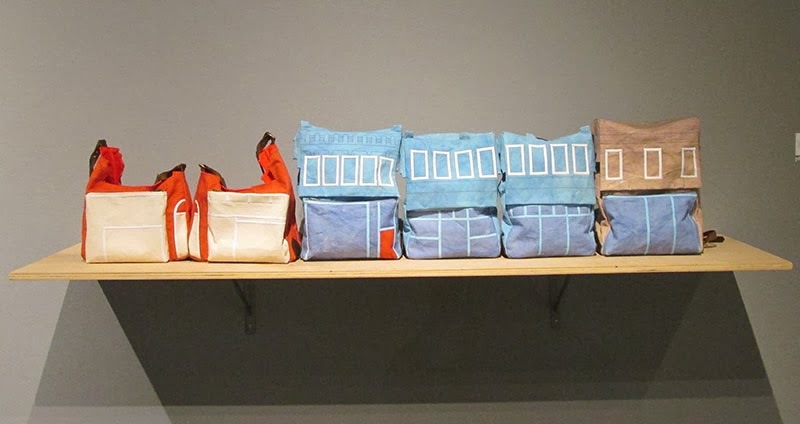 She made a series of backpacks that feature a Houston block. I think they're even for sale! Clever. There were a series of lectures also associated with the show. You can listen to them here. And speaking of Houston, a friend of mine in London, Claire Brewster, will have her work on display at the Art Gallery at HCC Centralin Houston. Click here for more info. 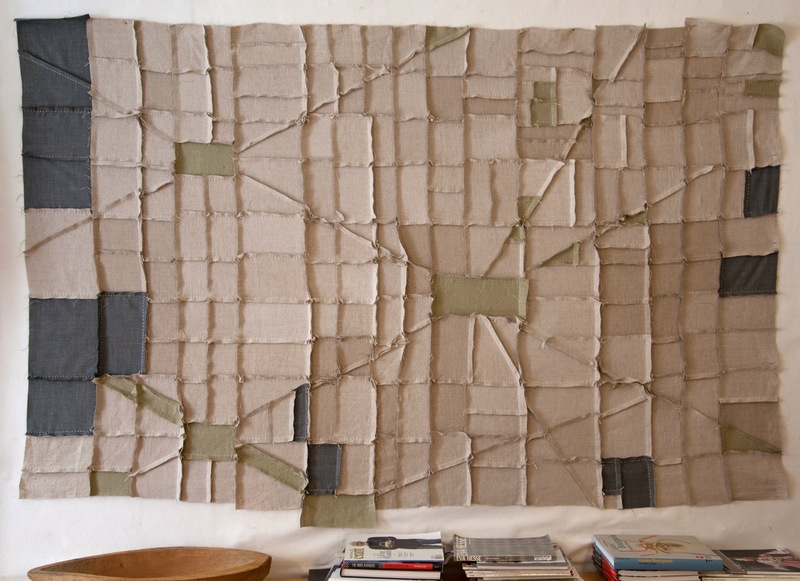 Coming soon, pictures of my new work in progress, the Oakland Foreclosure Quilt. Yes, I listened to you, the bay area, my home, could not be ignored! I've spent the past five years really honing in on a word in my art practice: failure. I've been purposely trying to fail in order to improve my work. Making mistakes make us wiggle and squirm in the studio but they are necessary in order to move forward in our practice. Several choices I've made in my series started out as spectacular failures but turned out to be the turning point in the success of a series. For the first time in my life I hope not to fail. I've had a bit of a health scare over the past few weeks that has upended our lives in ways I never knew possible. We are still waiting to find out what I have and more than any time in my life, I'm hoping the doctors don't fail me. I realized as I sat with an oncologist (yes, an oncologist) how hard her job must be. She approaches her work completely differently, the absolute goal of not to fail her patients. How hard is that to do? I am in awe of doctors and nurses these days. They have hearts of gold and are just so incredibly amazing. How do they deal with failure? Progress on the Idiom series. Choosing thread was a major decision! I am very curious how this life altering change I'm about to go through will affect my work. Will my work become more political, more angry? Will it become more sedate and calm? Maybe I'll just have to try both ways and see which one fails. I look back over all of the work I've done over the past five years and feel like I need to be doing more again. I've had a bit of a slow time in my art while I tend to my life: family, gardening, cooking. And I am passionate about all of those and will not let those go. I would love to be able to combine all of it into my art. Who knows where this path will take me in the next few months but I'll keep you posted. In the meantime, I hope to have some new art to share, perhaps small pieces but an effort nonetheless. Go hug your family and appreciate every second you have. Oh my how time flies. For eight hours each weekend this month, I've been sewing continuously among new friends at the Kimono Workshop at The Workshop Residence. It's been a drastic change from my usual weekends in Sonoma tending the garden. It felt strange to be in San Francisco on the weekends again. The Saturday before last was the final session and unfortunately, I wasn't able to stay for the kimono dressing ceremony that evening but hopefully I can link everyone to some pictures soon. However, I will have my very own kimono dressing as I learned that Maki, one of the teachers, happens to live two blocks from me in Sonoma. Very small world indeed! I can only imagine how much more labor intensive (though gratifying) it is to make a traditional kimono as opposed to our casual yukata we made this month. I have learned so much in this class from ironing to sewing that I never dreamed I could learn. Opening yourself to new ideas can make a world of difference in your creative life. I will never approach sewing the same way again. And oh my, the tools. The tools are so beautiful. I've become a convert to those japanese sewing shears. They're so much more quick to grab and snip than western style scissors. And the needles we used, all handmade and incredibly sharp, sharp, sharp. 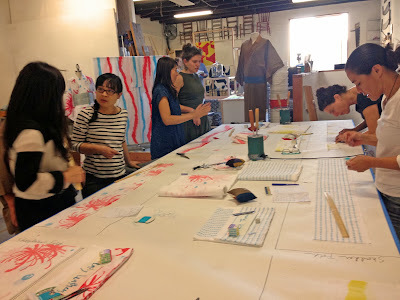 The end of the class was spent learning how to properly iron and fold our yukata for storage. The way it is folded keeps it nice and neat so no need for ironing when you want to wear it. The folding made a lot of sense as the folds run along the main seams, of which there are six. 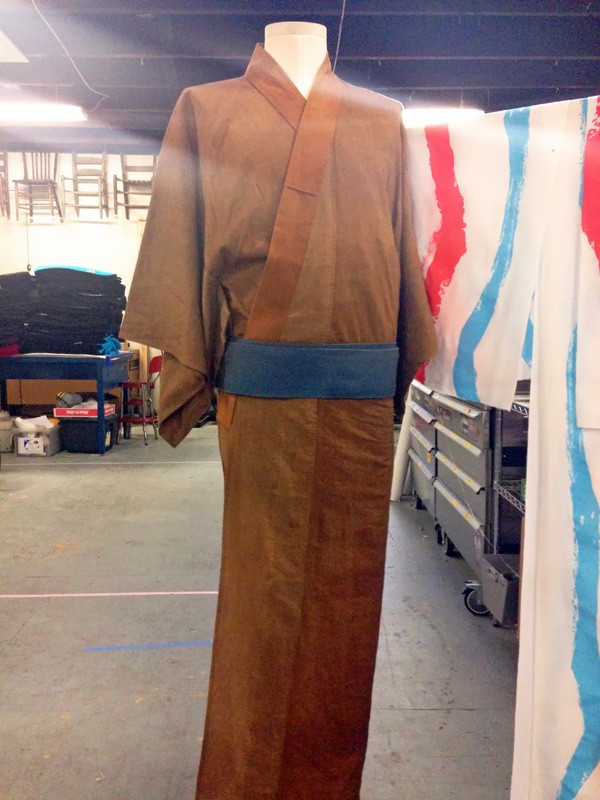 Here is what the yukata looks like completed with obi. Gorgeous, no? Below is a scarf Maki and Tsuyo made for sale The Workshop Residence. It's made with silk and linen and the pattern is by Maki from the last kimono workshop in the spring. I loved this one! 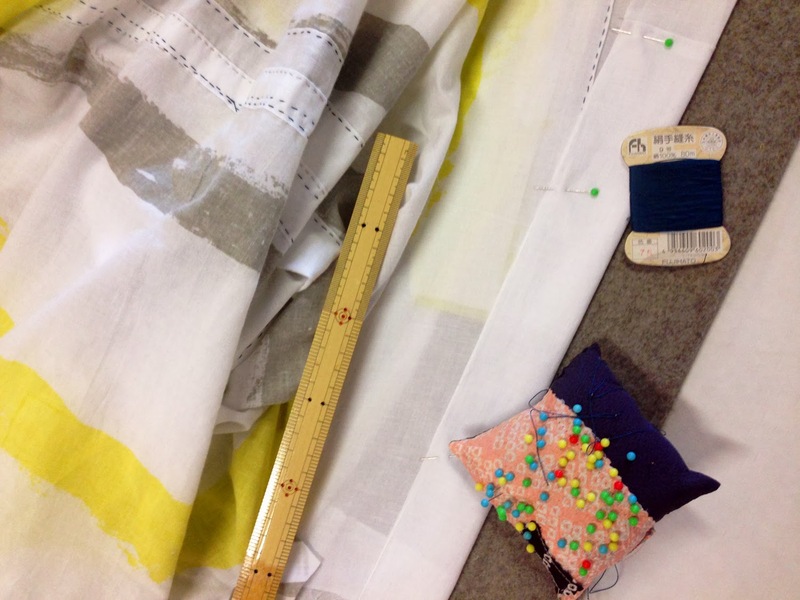 And she made some using a natural linen and silk with the new patterns that were used on our yukata. I think these could be hung as wall art when not worn they're so beautiful! They're $200.00 each and available while they last at The Workshop Residence. And here is last spring's yukata (men's version) using a cotton naturally dyed with persimmon. Now back to my regular life again. I'm curious to see how I sew when I pick my 'dress' back up next week. 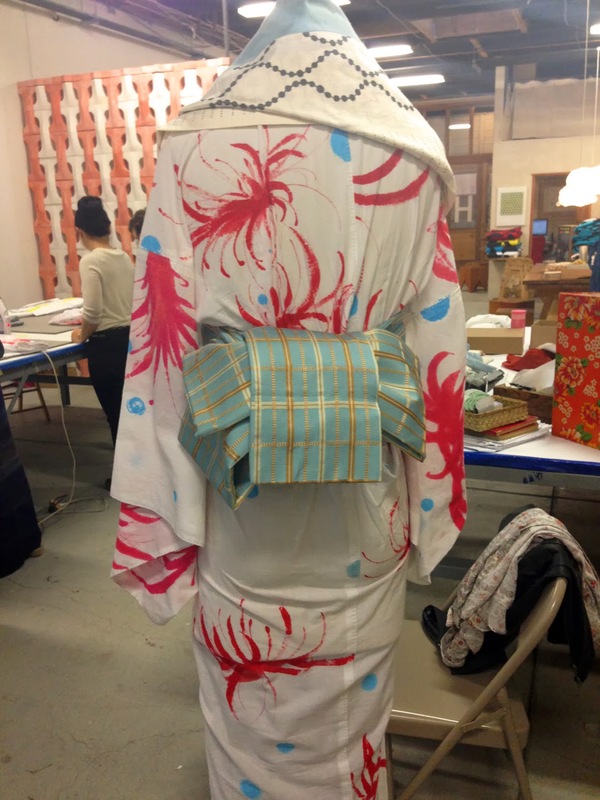 I just finished my first of three weekends at The Workshop Residence in a Kimono Workshop handstitching a summer yukata. 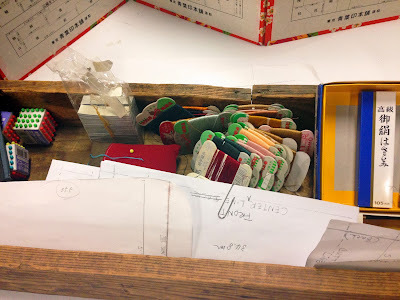 I've written about The Workshop Residence over at Handful of Salt, here. Our hosts are master kimono maker Tsuyo Onodera and her daughter Maki Aizawa. Here was our tool set below. Beautiful, no? The needles are handmade with the tiniest eye holes I've ever encountered and incredibly sharp. Quite a few people broke needles the first day trying to sew. 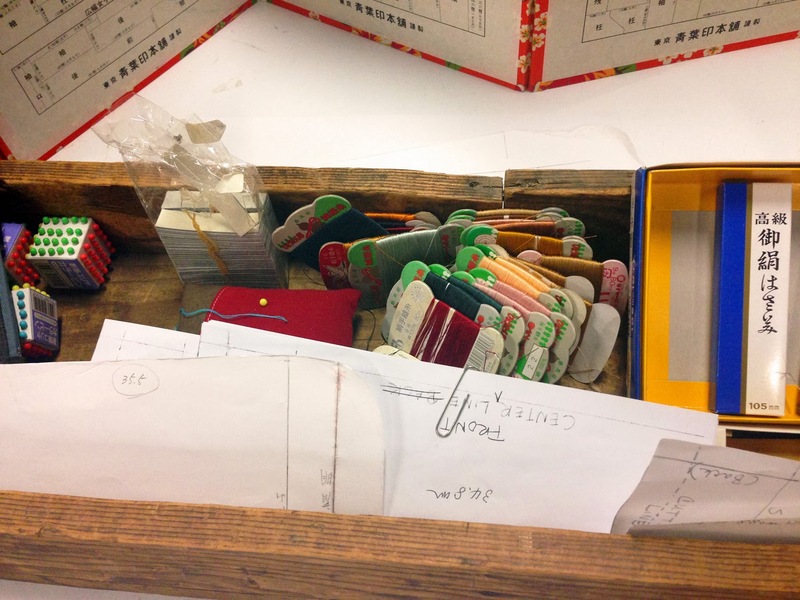 We each had our thimble finger measured and handmade leather thimbles made for us before the class began. I eventually switched back to my old standby which I bought in Japan, it's hard to break a habit! I knew I would be in for a treat as I'd peeked in on the previous kimono workshop that took place earlier this year. And I knew I would be learning some new techniques but I had no idea how different those techniques would be. 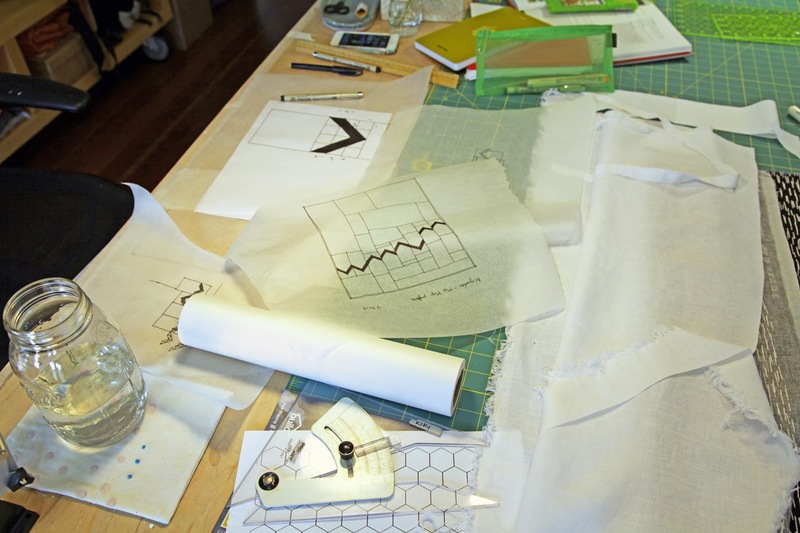 It's a whole other way of sewing and approaching pattern making. Below, Tsuyo demonstrates how you measure out the panels for each individual yukata. We worked on four pasic panels this weekend: two front and two back. There were the tiniest measurement variations in all of them to fit our bodies perfectly. A lot of it didn't make sense at first but once the panels started to come together, we had a lot of 'ah ha' moments among us. 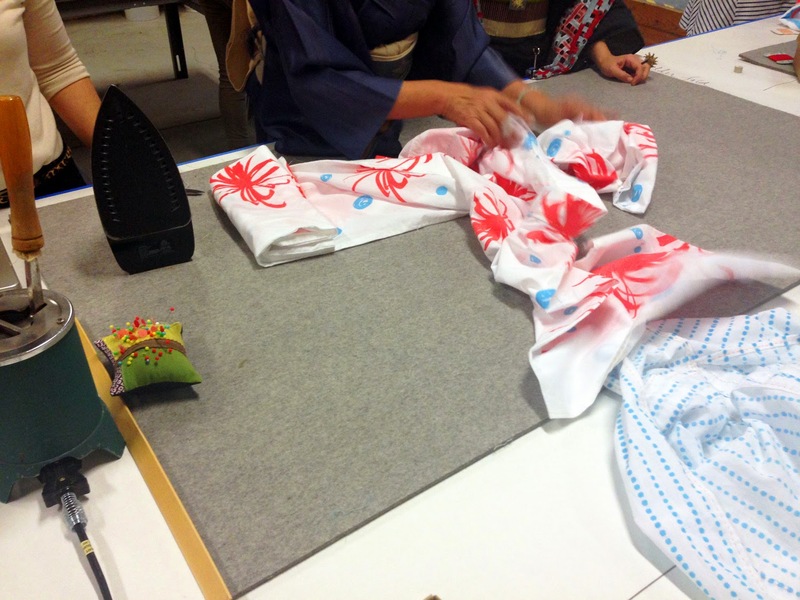 Since there are only nineteen hours in the workshop, we're just making a simple yukata which is what you would wear if you stayed in a ryokan or are visiting an onsen. It's a more casual kind of kimono. 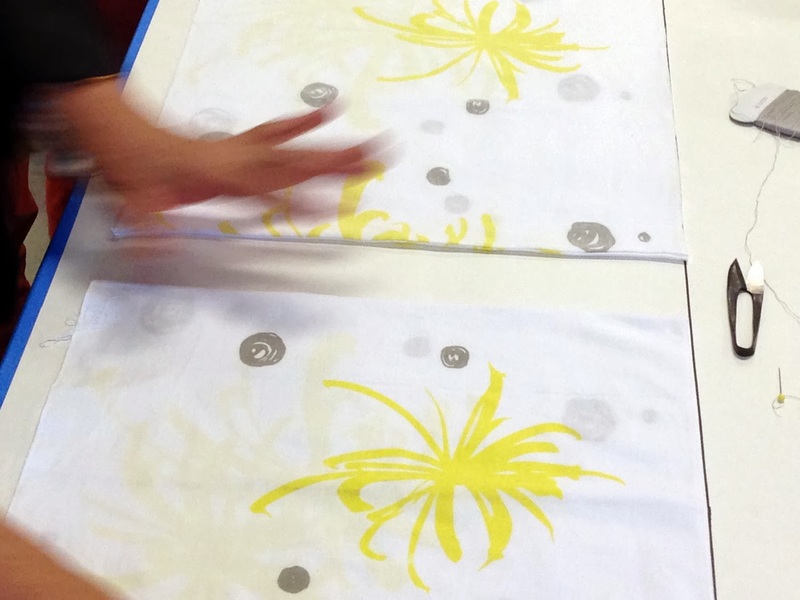 The colorful summer patterns were designed by Maki and printed by Zoo, Inc. who prints a of lot of fabric for The Workshop Residence. It was hard to choose a colorwave! 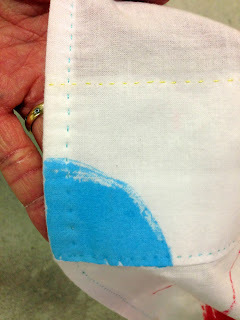 One of the more exciting discoveries for me was the use of a tiny iron to make markings in the fabric. 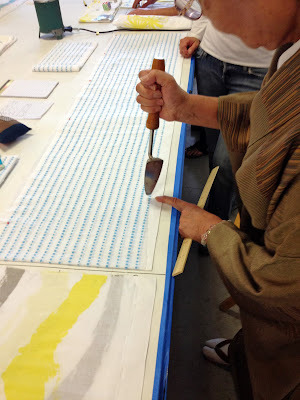 No tailor's chalk, no fading ink, just lines pressed with a sharp, hot iron point. I have to find one of these! The lines last for days and go through four layers of fabric. All measurements are in metric so we had to brush off our school brains and remember how much easier it is then the imperial system. The fabric in the foreground below is my colorwave choice, yellow and grey. Day one of the workshop had us sewing the four main panels together, along with the okumi that attach to the front panels. A lot of us had a little homework that night to catch up. Tsuyo demonstrated her sewing technique to us before we started and I was completely floored. Just watch this video and you'll see what I mean. I can't even come close to mastering this. Day two consisted of Tsuyo checking our work, including finishing off our main panels and okumi before moving onto sewing the sleeves. 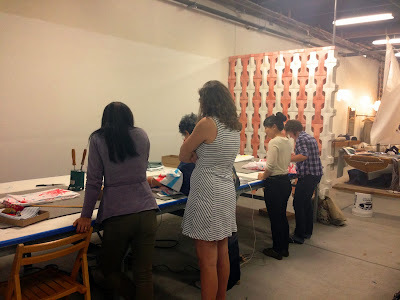 It was quiet at times while we furiously sewed but the mood was casual and fun. 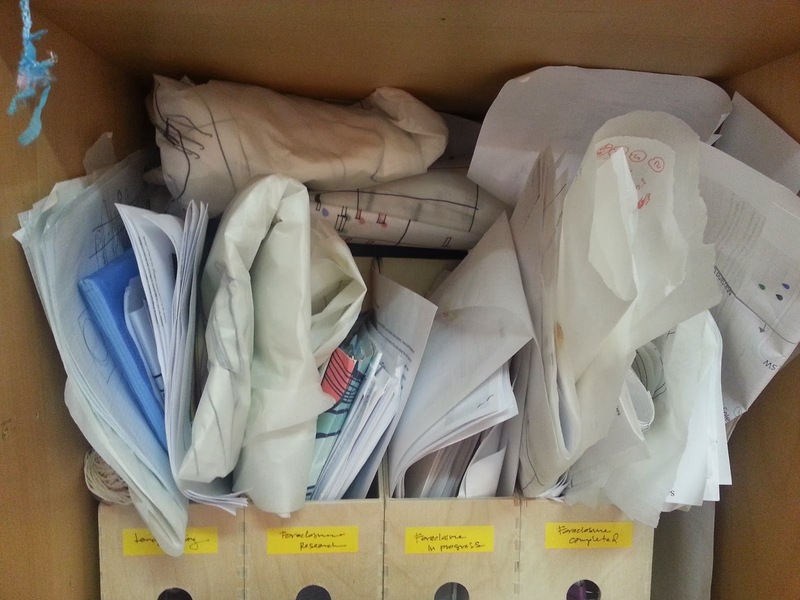 Some students had never sewed before and some had some experience. We were all on the same level in this class, learning such a new technique. At the end of the second day, we started in on the sleeves. The basic sleeves are below and what looked like a simple sewing job was a challenge at first. All of the lengths of stitching is done with a single piece of thread, no knots and start overs halfway through so you had to make sure you had enough thread before you started. 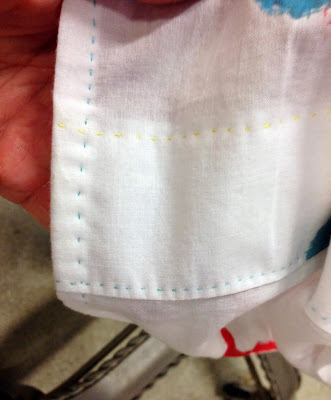 The sleeves had a single thread that turned 90 degrees with backstitching halfway so you had to remember to push your fabric to the end to avoid bunching before you backstitched or you had to start over. There was a lot of millimeter and centermeter measurements that made sense once we started. Tyuyo demonstrates the final stitching below for a sleeve: at 21 cm from the top of the sleeve, 3 backstitches at 8mm, 3 backstitches at 9mm and then three backstitches at 1 cm to secure the sleeve opening. Such detail! We sewed all of the hidden stitches for the first two days to give us some practice for what was to come next: the top stitching to be done at home during the week, eek! I snapped a few photos of the finished yukata example to help me figure it all out! 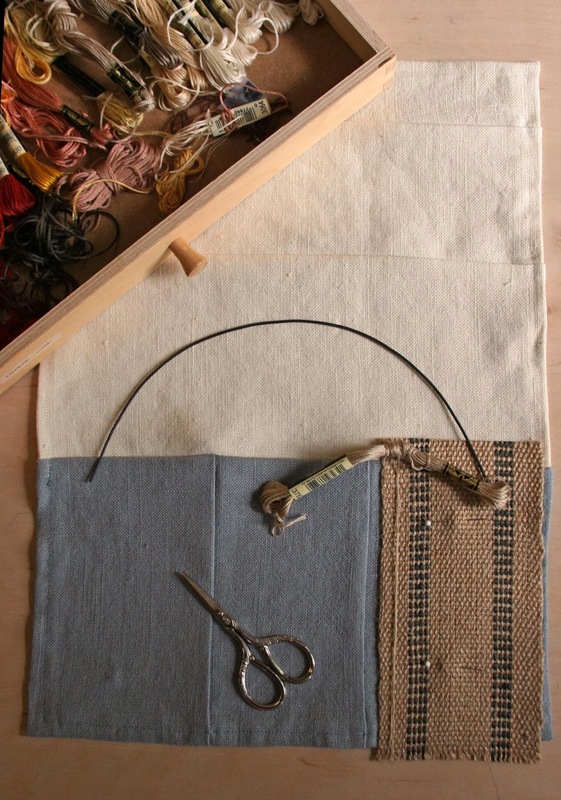 This is where you can really be creative, choosing a topstitch thread color. Look at those stitches, perfect! I know I can make a pretty top stitch when I'm working from the top but on some of these stitches, we'll be working from the back, in reverse, so I better up the quality on the backside of my stitches fast or this is going to look bad! I choose a dark blue/turqoise thread as a top stitch, very high contrast with the white, grey and yellow. Wish me luck! Next weekend we will attach the sleeves, add more top stitching, finish the waistband or obi and make a collar. A lot more to do! 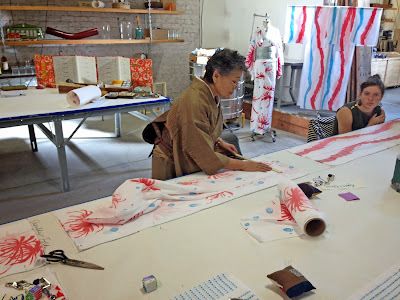 In the meantime, if you're in the San Francisco Bay Area, stop by Thursday night, November 14th from 6 to 7:30 at The Workshop Residence to hear Tsuyo speak about her experience as a kimono teacher for the past fifty years in Sendai. Yes, that's right, Sendai. Go here for more information. Learn more about The Senninbari Project that Maki started with her mother here. 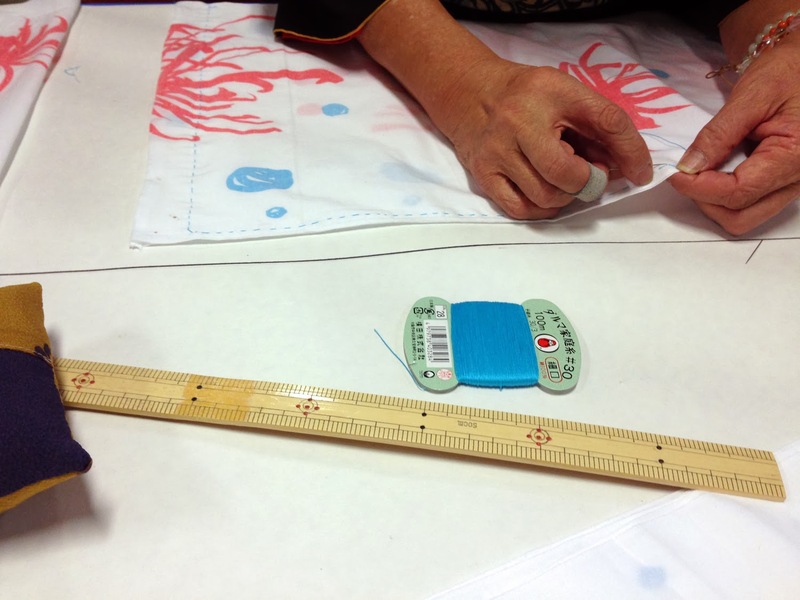 It is a sewing collective of women in Tohoku, Japan who lost their homes and livelihoods to the tsunami of 2011. In addition to featuring my art, I created this blog to inspire and inform other artists who work in the unique genre I call articraft. 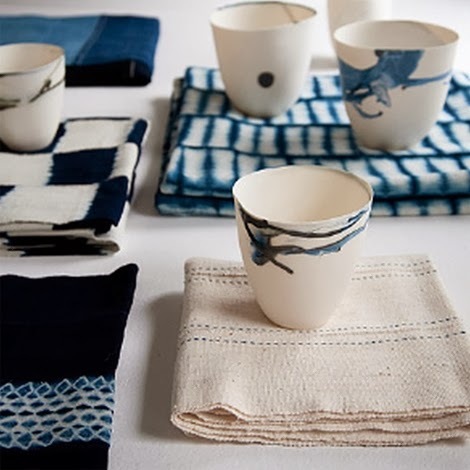 I feature artists who use craft and craftspeople who make art.